Can You Find Alex in this Picture? It all started a long time ago with bedtime readings of Ray Cannon's "Sea of Cortez". 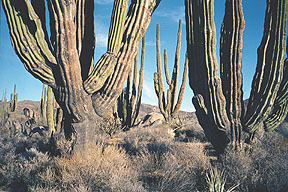 Alex developed a fascination with cactuses. Driving south he badgered me about their absence until the highway turned east at El Rosario and they were everywhere. His favorites were the stately cardon and the creeping devil. We encountered the creeping devil at Mag Bay where they lay on the sand like fallen logs. Near Loreto we discovered a species called the "sour pitaya". I lopped off it's spiny fruit with a knife and cut it in half. The interior resembled watermelon with tiny seeds but were essentially flavorless. Our first stop was the San Lucas RV park. It was too windy to fish so we went about clamming. That evening I set the pot on the stove and watched it come to a boil. Suddenly one of the clams seemed to go into convulsions. It appeared to be opening its shell and trying to get out. Then two small legs appeared and frantically tried to open the shell. A small octopus had decided to make a home in one of the clams and now was paying the price. The hot water rushed in, the movements subsided, and soon it was all over. The whole episode was really sad and left a bad feeling in my stomach. Alex told the entire campground about it. 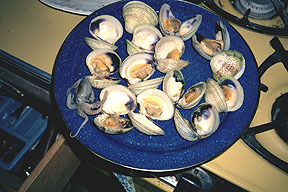 The photo shows the poor fella amid the clams. There was more to come. The following evening just before midnight I watched Alex suddenly sit upright in bed and undigested macaroni poured out of his mouth. It came out in bursts. Almost reflexively, I tried to stop it by covering his mouth but only succeeded in getting both of us dirty. By the time I got the trash bag ready it was pretty much over. The sleeping bag, blanket, and pillows lay drenched in tuna casserole (the one thing I know how to cook). I was not a happy camper that night. The following morning we packed and headed for Mag Bay. Upon arrival I was warned about theft in the area and decided to camp next to an Indian fishing village as a precaution. The fishing was superb amongst the mangroves. Alex caught spotted bay bass on every cast the entire morning. As a joke I called these fish �sour pitayas�. Alex didn�t see the humor in that. 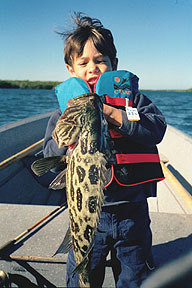 The prize fish of Baja�s lagoons is the broomtail grouper. I had never caught one before � until this trip. You need to cast right next to the roots of the mangroves. Once hooked there is an immediate lunge back to the roots which needs to be stopped. We caught and released several nice groupers, one of which my son is holding in the photo. It was during lunch that I first noticed them � miniscule insects leaping about the kitchen table. They turned out to be fleas. Alex had befriended an adorable Indian puppy during our stop and was now infested with them. I tried crushing them with my fingernails but found them to be almost indestructible. Well, what�s a few flea bites? I thought to myself. The following morning I examined Alex�s body and was horrified. He looked as though he had the measles. His entire torso was ravaged with insect bites! We packed up and headed for Ciudad Constitucion. I couldn�t find flea spray anywhere. I was finally directed to a veterinarian who sold me flea powder used agriculturally on livestock. Mentally, I planned it all out on the way to the hotel room. We stripped off our clothes into sealed plastic trash bags. I washed Alex repeatedly that night until he protested. I sealed all unpacked garments into trash bags. After purchasing a bucket and spray bottle, I dissolved the powder and filled the bottle with the solution. I sprayed everything I could find in that camper and closed it tight for the night. After his experience at Mag Bay Alex,understandably, no longer had any desire to return to its great fishing. On the road we talked about the implications of fleas in life and he noted that Davey Crockett must have had a serious problem with them due to the coonskin hats he always wore. 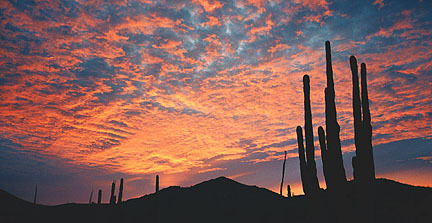 Puerto Escondido, just south of Loreto, has one of the best and most expensive RV parks in all of Baja. A submerged crator of volcanic origins, it provides shelter from all directions. 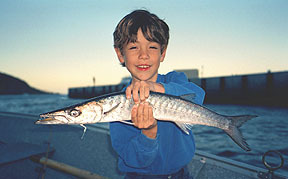 Alex caught his first barracuda there and fell in love with them. He hooked it while trolling in the evening and the fish went airborne. They are nasty creatures. Once in the boat they slash and bite at everything in sight. Eventually they succeed in wrapping the landing net so tightly around themselves that it becomes very difficult to extract them from the mess. Alex had never seen one of our local fish do that before and was impressed with the whole thing. Loreto has a flyshop now, complete with maps and directions to the most productive spots in the area. They advised us to fish the shallow reef on the south end of Carmen Island. The reef had large schools of sardines over it. We simply sat in the boat until somewhere the water erupted and the pelicans started to dive. I would motor over to the area and hooked fish immediately. We caught 3 species of cabrilla, snapper, pargo, 2 species of triggerfish, grunts, needlefish, ladyfish, and sierra. Several large dorado came to the boat but I couldn�t entice them to the lure. Schools of 20 lb roosterfish would smash bait near the shoreline but I just could not move the lure fast enough to trigger an aggressive response. Alex particularly liked the needlefish. I watched him admire its peculiar shape and color for long periods of time as it lay in the bottom of the boat. He seemed to be attracted to fish that looked dangerous and the needlefish was certainly one of them. We fished this reef from sunrise to sunset without noticing the time go by. A school of halfbeaks showed up and immediately drew the attention of the big boys. Periodically one would come out and flee across the surface much like a stone being skipped over the water. Sometimes a dorado would greyhound across the surface in hot pursuit. Watching the display, Alex often looked spellbound by the whole thing. Sierra Giganta, a 5000 ft high mountain range runs along the highway next to Puerto Escondido. 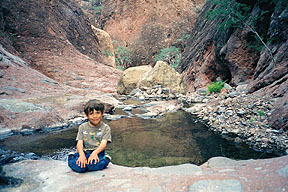 On windy days, Alex and I explored the canyons that led up into the mountains. As we gained elevation we went from a dry arroyo to hot puddles of water overgrown with algae to clear cold basins of water that resembled many of our High Sierra trout destinations. Curiously enough I discovered that the stream insect communities were totally different than ours. Mayflies, caddisflies, and damsels were totally absent. Dragonfly larvae seemed to dominate the stream. Large black beetles with blue and yellow markings seemed to be rowing everywhere. They were remarkably fast and agile. We climbed until the deep pools were bordered by sheer vertical canyon walls and then we turned back. The largest fish of the trip, a 12 lb jack crevalle, was caught during one of our evening barracuda sessions at P. Escondido. The fish hit the lure during the troll and line just screamed off the reel. I never tried to stop him. I only paid attention to the drag setting and wondered what kind of fish it could be. As it circled beneath the boat I speculated it might be one of the large pompano rumored to be in the bay. Alex was the first to identify it from pictures he had seen in the Peterson guide to fishes. Eventually we grew tired of the area and drove to the San Lucas RV park. 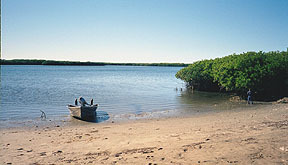 This spot is very popular with the gringos and there was a sizable angling community when we arrived. These vacationers are often referred to as �snowbirds�. We met people from Alaska, B.C., Colorado, and Oregon. Many were on 3 month vacations. Alex and I were invited to a potluck Christmas party that the campers had put together. It was a festive affair with the adults socializing while the children ran about. This was followed by an evening campfire on the beach. A trio of guitarists played and sang Christmas carols with the children. They send them to a boarding school here. You see those towers over there (we were passing the state penitentiary) There are guards up there watching for boys who try to escape. Alex was always on his best behavior during these frequent stops and I learned a valuable lesson about parenting. 12lb Yellowtail off "Haystack" Pt. 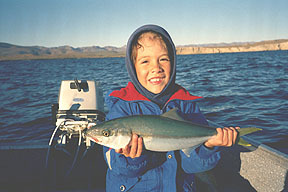 The San Lucas area is noted for its winter yellowtail fishing. 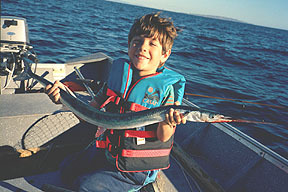 There are large 35lb mossbacks at the island offshore but these require live bait and heavy tackle. Instead, Alex and I fished for the 4 to 5 pounders at �Haystack�. These fought about as well as small skipjacks. I think my son was really surprised at their explosiveness near the boat. In fact, he gave me the rod initially complaining that it was to much for him to handle. These fish would wrap the rod around the hull as they circled just beneath he boat. 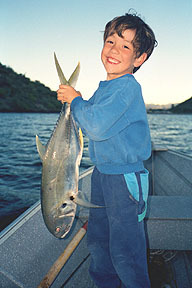 He eventually learned the technique of pumping a fish with the rod and was able to handle the larger fish. We ate yellowtail one night and it was good, but not as good as the grouper at Mag Bay. Driving in Baja is never boring. On several occasions we encountered large groups of vultures feasting on roadkills (cows). On the way back we took a side road from the main highway and camped overnight. We witnessed one of the best desert sunsets I had ever seen. The evening cloud formation resulted in a mackerel sky. Once the sun dipped below cloud level it's rays fell on their underside and the entire sky lit up like a furnace. I ran for the camera and had about 5-10 minutes before the show was over. We crossed the US/Mexico border on New Year�s eve. There were only 5 cars in our lane at the crossing and the border guard never even asked for our documents. It felt luxurious to be driving once again upon a smooth 8 lane highway. I didn�t realize how much I had missed the creature comforts until then. We motel 6�ed it back home taking long hot showers and watching HBO movies late into the night.